If you have a lil' alice product & you love the fun & fancy fabric & how it makes you smile, please share that with us! You can email your product reviews to lilalicesews (at) gmail (dot) com. If you have a clear picture that shows off your lil' alice product, please enclose that too! Lynda: This oil pouch is so cute and so well made! Every detail from the Lil Alice tag to the Made in Michigan label on the inside shows how much time and care has gone into the pouch. Shipping was super fast and the packaging it arrived in had as much care taken as the pouch itself. Thank you for my oil pouch! Now for the hard part...which oils to put in it! Lin: Bought this second purse as a gift for an essential oil user, and I know they will be thrilled :-) Even if you don't use essential oils, the little elastic sections would be great to organize your cosmetics - keep the lipstick standing up so the top doesn't come off!! Even after I have my oils in it, there is still room in the center for other goodies. Great design, excellent craftsmanship. Wow! This little purse is wonderfully done and expertly sewn. I can say this with many years of sewing experience myself so I am a pretty good judge of workmanship. I am so thrilled to have a lined bag for my essential oils - thank you! That and "Kid in a Candy Shop" because that's what I felt like when I started looking around her Etsy Shop. Just you wait. The quality of all the products including the tote was top notch. It appeared machine made even though it's handmade with a machine. Can you see from the pictures how straight the lines are? From looking at it, it's hard to believe that it's made of a tyvek-like material. Especially given it's snazzy design. I took a wet cloth to it but it hardly felt wet even though it's porous. The base and handles are self supporting causing the bag to stand up on it's own! A real advantage when you have two kids to hold onto leaving no hands for loading (smile). The bag holds tons of food yet folds up to fit in your hand. The matching coupon case is brilliant. I'm always forgetting my coupons and/or losing them in the bottom of my non-existent purse. Note that I added the carbineer. It attaches nicely to the tag on the case. Something for Alice to consider, perhaps? Next up was the reusable snack bags which I think should be called "adorable bags for every occasion". Seeing as they were lined with an easy to wipe fabric, you could use them for your makeup or toiletries. With tons of beautiful fabrics to choose from, you might not be so willing to give them to the kids. Measuring at 5.5x7", two cups of Cheerios fit in the bag with room to spare. I liked that the inside liner didn't have any crevices or creases for food to hide in. When we're driving to Mexico, sometimes all I can do is wipe the bag down until we get to our final destination. Last but not least is the coin purse a.k.a. My New Wallet. For the past five years, I've been using a much smaller coin purse for all my cards, money and coin. Given all the cards I carry around now, it was too small to fit everything, however, I didn't want to go to a "traditional wallet". This works perfectly! I really can't say enough great things about my experience with all of the products. I love that they're Made in North America, Michigan to be exact and the larger items are marked as such. Along with the lil' alice tag, a really nice touch. Well worth the money. Give the Gift of Homemade with lil' alice! Katey G. says: "I purchased the lil' alice scarf for my best friend's birthday and it was a hit! The scarf is super soft and very versatile! The snap scarf can be worn different ways for any outfit, my friend is currently nursing her newborn and she has already used it as a cover! Genius! Not only is it a scarf but she can use it as a swim coverup or halter top. Spring, summer, fall or winter... This scarf is a must in your closet! Thank you lil' alice for your adorable products- I will always be a customer of yours." Julie says: "I love my lil' alice flat iron case. I use it all of the time. I travel quite a bit for work and vacations so I am constantly packing my flat iron at the last minute while it is still hot. In the past, before packing I would try to cool off my flat iron by sitting it by a fan or simply just waiting for it to cool, which would take too long. Now, with my lil' alice flat iron case I can just pop it in the case and off I go. I never worry about it being too hot once it is in the case. I also use it at home when I need to store my flat iron out of the way. The product is great because my flat iron gets very hot and I can slip it into the case and not worry about it burning my hands or melting anything else around it. 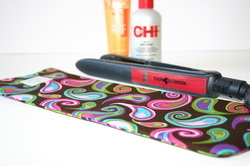 Not only does it help with temperature, it also protects your flat iron when you want to store it away. This product is great. I have given it as gifts to my friends and family. I would recommend it highly. It protects my flat iron and has made my traveling life much easier. Thanks lil' alice."